Today's August Break prompt is handwriting, so I wrote out the prompt-quote from the 30 Days of Journaling prompt and overlayed it onto a very chaotic self-portrait/ archival (#wabisabidetourinJapan) multiple exposure. There's 5 layers of photos in there? Or six? I forget now. Anyway, it's certainly chaotic. 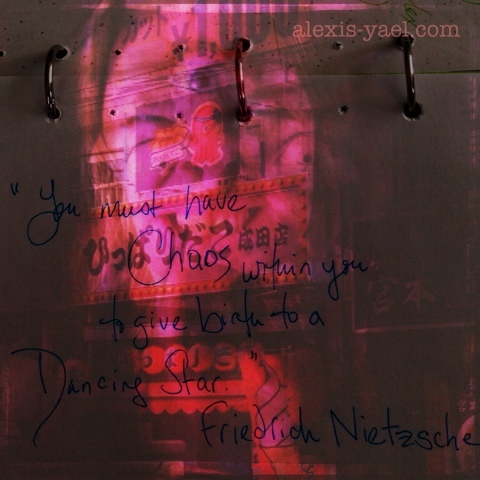 Which matches the quote by Friedrich Nietzsche: "You must have chaos within you to give birth to a dancing star." Here's the thing, I agree and disagree with the quote. Lemme explain. On the one hand, I think our monkey minds breed chaos. Thoughts = chaos. And the artistic impulse (what I think he's getting at with the poetic "dancing star") is absolutely chaotic, in that it is not easily controlled. But on the other hand, if you don't take charge of your thoughts, and your artistic impulses, you're gonna wind up a mighty monkey-driven person. That's where substance abuse, out of control mental health issues and plain old not-doing-well are gonna try their best to get their paws on you. And succeed, if you let it get that out of control. Monkey-mind isn't overly concerned with playing nice. It likes chaos and drama and it's gonna breed those things until you take charge. This is what practice is to me. And yes, I come from a zazen (sitting) meditation background ("monkey mind" being a very chan/zen Buddhist idea). I'm not currently meditating (I go in and out of formal sitting practice), but my everyday practice is still zen at its core. Finding the love in the grief. Finding the hurt in the anger. Finding the calm in the chaos. As much as I love the chaos of birthing dancing stars (poeming, photoing, arting) I know that the calm is necessary, too. Ying yang. Ebb and flow.